I am interested in the evolution of symbiotic lifestyles and investigating how major biotic, climatic, and tectonic events may have influenced the timing and patterns of diversification. Much of my current research is centered on the carabid beetle subfamily Paussinae, which contains many obligate ant symbionts. Other ongoing projects explore the evolution of bombardier beetles and ground dwelling arthropods in the Madrean Archipelago of the Southwestern US. I have a deep appreciation for the largely untapped value of data in natural history collections. Specimens are the physical evidence for virtually everything we know about biology, they anchor our species concepts, hypotheses of relationships among species, patterns of distribution, as well as our more general theories about evolution, biogeography and biodiversity. While collections represent the single largest source of information we have on planetary biodiversity, they are largely under-utilized and therefore also under-appreciated. As curator of the University of Arizona Insect Collection, I am committed to collections care and enhancement, and the use of bioinformatics to make collections-based data widely available to diverse user communities. The Arctiinae (Lepidoptera: Erebidae), or tiger moths, are a conspicuous part of the fauna in the Madrean Sky Island Region where many endemic species occur, some of which are undescribed. Caterpillars of species in the tribe Lithosiini, the so-called lichen tiger moths, feed nocturnally on lichens and mosses and the adults are often aposematically-colored. Research on their chemical ecology indicates they sequester toxic polyphenols from the lichens. Besides their warning colors, many of these moths exhibit acoustical aposematism, producing clicks to warn bats of their distastefulness. The taxonomy of the Lithosiini is in need of much work, largely due to the huge size of the tribe (somewhere between 4000 and 5000 species) and its worldwide distribution. Preliminary molecular phylogenetic analyses indicate the tribe is not monophyletic. As part of my dissertation work, I am adding to this phylogenetic framework by including new sequences from the 60+ species of Lithosiini known from North America. Among lithosiines, I am particularly interested in the phylogeny and natural history of the genus Crambidia. Canadian entomologist Gordan Ayres (1958) observed that caterpillars in this genus are myrmecophilous (obligate associates of ants). I am conducting a detailed systematic revision of this genus and documenting the relationship between these moths and their host ants through rearings, behavioral observations, and histological studies of glands involved in this relationship. Read more about John's research interests in "The Moth Hunters." My research interests are in the processes—both past and present—that influence species distributions and diversification, and how insights into those processes can be used to inform conservation. Currently, I am examining the biogeography of ground beetle (Coleoptera: Carabidae) species within the Madrean Sky Island Archipelago of the southwestern United States and northwestern Mexico as part of the Arizona Sky Island Arthropod Project. I am specifically interested in the flightless species Synuchus dubius LeConte which contains populations isolated on Sky Island mountain ranges. Using molecular phylogenetic techniques to reconstruct their evolutionary history, I will uncover patterns of population differentiation. I am interested in insect systematics, phylogeography and host-symbiont interactions. I am currently investigating the host-parasite associations between beetles of the subfamily Paussinae (Carabidae) and their host ants. Different species of paussines have varying levels of specialization and striking adaptations for living with ants, including chemical and mechanical strategies. For example, Paussus favieri emulates their host ant’ stridulations which allow them to be integrated inside the nests of Pheidole pallidula. For my dissertation research I plan to use molecular phylogenetic techniques to compare the evolutionary histories of these parasitic beetles and their host ants. I've been interested in biotechnology from the first day I was introduced to it. I especially enjoy growing bacteria on agar plates. I started to pursue a microbiology degree by attending Pima Community College and now I am looking to transfer to the University of Arizona. I was introduced to the Moore lab through a summer internship (Steps-2-STEM). Ever since then, I have continued to work in the Moore lab and, by doing so, I am learning a wide variety of new biotechnology skills. I am currently a freshman pursuing a degree in Ecology and Evolutionary Biology at the university. I'm fascinated by insects and other terrestrial arthropods, especially spiders. My specific interests lie in the natural history, biodiversity, systematics, and distribution of North American spider species. I have been thoroughly enjoying my work on the curation and identification of the UAIC Araneae specimens. I am interested in where the worlds of microbiology and entomology overlap. I am surveying the microbiomes of bombardier beetles (Brachinines and Paussines) and exploring if and how microorganisms impact their physiology and their relationships with other organisms. I am interested in museum collections as active and accessible resources to preserve and document our planet's biodiversity, using specimens and associated data for scientific research and public outreach worldwide. I am the Collections Manager of the University of Arizona Insect Collection (UAIC). 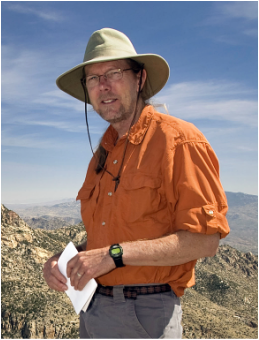 I am helping Wendy Moore (PI) coordinate two NSF-funded projects in the UAIC, a collections improvement grant and the Southwest Collections of Arthropods Network (SCAN). I am also identifying ground dwelling arthropods collected as part of the Arizona Sky Island Arthropod Project (ASAP). My research program focuses on the evolutionary biology of insects, primarily the systematics, taxonomy and biogeography of beetles, most notably Ptiliidae (featherwing beetles), Hydroscaphidae (skiff beetles), Sphaeriusidae (minute bog beetles) and New World species of Limnichidae (minute marsh-loving beetles). I also work on fossil insects associated with pack rat middens to help us better understand the past & recent fauna, flora and climate of southwestern deserts. I am interested in the exploration of invertebrate diversity through photography. I work with both living and preserved collections in the laboratory setting. Working in the field is one of my great loves, I regularly participate as the primary photographer for biological surveys in the Sky Islands of the US and Mexico. For the Moore lab, I am utilizing the Visionary Digital Imaging system to help catalog and photograph the carabid beetle subfamily Paussinae as well as ground dwelling arthropods collected as part of the Arizona Sky Island Arthropod Project (ASAP). James Robertson, Ph.D. 2010-2017 James is now a Molecular Systematist for National Identification Services at USDA-APHIS-PPQ in Beltsville, MD. Tanya Renner, Ph.D. 2013-2015 Tanya is now an Assistant Professor in the Department of Entomology at Penn State University. Paul Marek, Ph.D. 2010-2013 Paul is now an Assistant Professor of Insect Systematics at Virginia Tech. Wallace (Marty) Meyer, Ph.D. 2010-2012 Marty is now an Assistant Professor of Biology and the Director of the Bernard Field Station at Pomona College. Jeff Eble, Ph.D. 2010-2012 Jeff is now a Research Associate at the University of West Florida. Reilly McManus, M.S. 2015-2017 Reilly is now the manager of my molecular laboratory in the Entomology Department at the University of Arizona. Garrett Hughes, Ph.D. 2010-2017 Garrett now works as an Entomologist for USDA-APHIS-PPQ in Texas. Angela Hoover, M.S. 2014-2016 Angela works as a research assistant with Dr. Michael Bogan at the University of Arizona. Antonio Gomez, M.S. 2012-14 Antonio is pursuing his PhD with Dr. David Maddison at Oregon State University. Chris Bibbs, M.S. 2012 - 2014 (co-advised with Dr. Dawn Gouge) Chris works for the USDA in Florida. Jason Schaller, M.S. 2011-2013 Jason is the Curator of Entomology at the Albuquerque Biological Park in New Mexico.